Salt, pepper, garlic seasoning, some red pepper flakes..whatever you want! Heat 2 TBS olive oil in a large, deep skillet over medium high heat. Sauté minced garlic and then add onion and cook for 1-2 mins. Then add chopped Chorizo and cook another 2-3 mins. Stir in the reserved chopped eggplant and chopped mushroom. Season with salt and pepper. Pour in wine, and cook 5 minutes. TAKE EGGPLANT SHELLS OUT OF OVEN. Next add chopped shrimp and cook 1-2 mins. Add breadcrumbs if too moist, a little at a time. 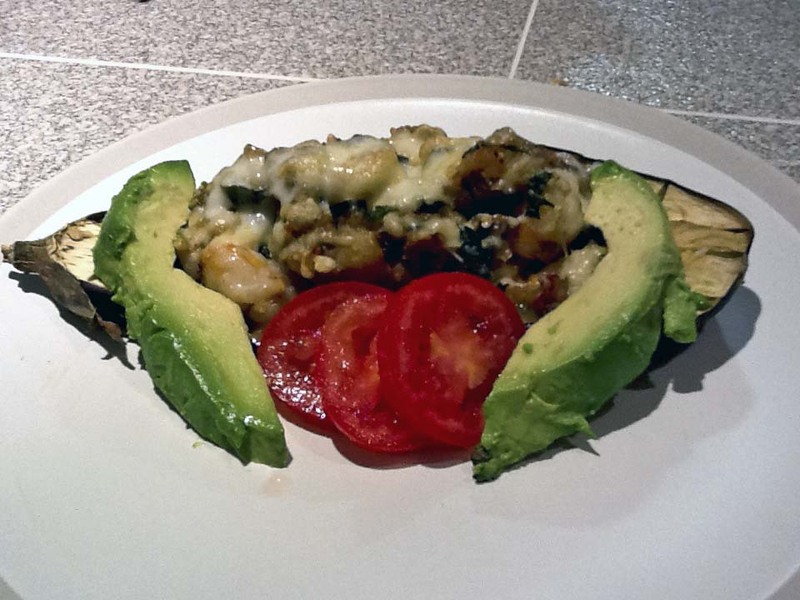 Bake in preheated oven for 15-20 minutes, or until eggplant is tender.